When my dad was here, we built a 6 ft wide by 7 foot tall barn door to slide over the office opening in the entry way. I purchased barn door hardware from the website rusticahardware.com which allowed me to customize it to my needs. With the hardware purchased, I could draw the plans for the door. I configured the door based on one very important measurement for the hardware – the door had to be no more than 1 3/4 in thick and no more than an 1/8 smaller than that. This measurement drove the design. I cut plywood to size and glued 1×6 planks of MDF on top of it. To frame out the top portion I glued and nailed 1×3 pieces of pine. To frame out the entire door to hide all unfinished edges, I glued and nailed 1×2 pine to the outer edges. We built the door in no time just hours before my dad flew home. I thought, “I’ll paint this thing tomorrow and have it hanging by the weekend.” I should know better than to make such far reaching claims. It took some time just trying to figure out what color to paint it. It’s big and takes up a lot of wall space. I color matched the blue/gray from our curtains and after priming, I painted two coats. I was feeling pretty good about the whole thing. Until my husband walks by and says, “That’s not the final color is it?” He claims he was just wondering because he was unsure – but of course if someone says that you start to question. For days I walked by the door in the garage wondering if I should repaint it. I finally painted a scrap piece and set it against the wall in the entryway to get an idea of what the door would look like. It didn’t take long before I was back at Home Depot buying more paint. But painting it was so tedious that I thought I would spray paint it this time. I had painted some benches a while back and they turned out great, so I bought the same color and started painting. Coat after coat after coat I sprayed the door. After 9 cans of paint – I loved the color and coverage, but the sheen was splotchy and I was devastated. No matter what I did I couldn’t get it even. I researched on-line with no luck. I tried a wipe-on polyurethane in one section just to see if I could get an even sheen – no luck. I was deflated. I hate when I waste time and resources working on a project! I knew I had to paint the whole thing again with a brush. But of course spray paint is oil-based and I was using latex paint, so I sanded the door for hours. I didn’t take all the paint off but I made sure the old paint was good and rough. I meticulously cleaned the door and painted by brush (color matched to the spray paint) the door with two more coats. 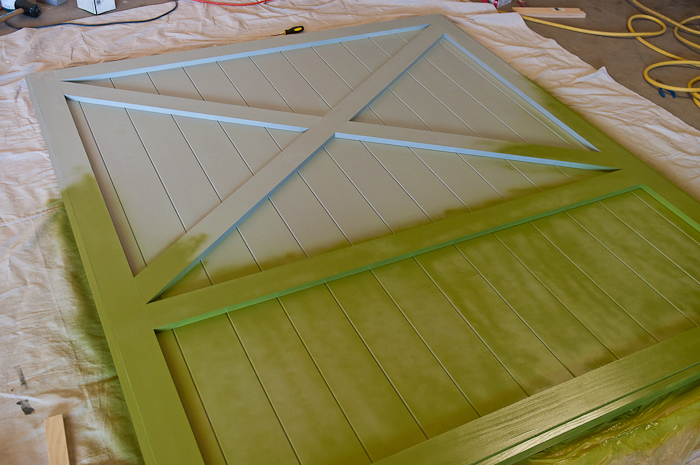 The door might very well be 10 lbs heavier just with the addition of paint alone! After attaching the hardware, we were ready to hang it last night and with some help from family (it’s a very, very heavy door) we managed to get it on the wall – and I sang praises when that heavy door didn’t rip the hardware right off the wall! I was a little concerned. Maybe more than a little. Thank heavens this is done. Building it was a breeze (which is usually how my projects go) but the finishing detail (paint/stain) always takes longer than I anticipate and its not the part I enjoy. Steve and I are both excited to reclaim the garage that has been overtaken by the project for over a month now! It’s done and I love it and I’m so happy I went with the punch of color as opposed to the neutral blue/gray. More importantly, I’m free to start something else! We don't know each other, but I went to school with your husband. I just wanted to say, I love all the projects you are doing they keep me inspired! You're right, we don't know each other – but I love your boards on pinterest so that pretty much makes us good friends!! I agree! Its amazing how you can feel like you know someone just by their pinterest boards! Some day we must meet, we probably would be good friends!!! So fabulous–and so straightforward! What does it look like from the inside with the door closed? Are you OK with a giant green piece of plywood? hahaha Would there be room with the hardware to put the additional 1x3s on the other side, too? I totally forgot to mention the back of the door! The back of the door is just sanded plywood, but I painted it with black chalkboard paint. So when the door is shut, I have a chalkboard in my office (I think I'm going to chalk some cool quotes on the back side of the door and occasionally use it as a photo backdrop. I couldn't put 1x3s on the back side of the door because then it would've made the door too deep. I know you can custom order from the same company to fit whatever door depth you desire, but I went with one of their two standard sizes to get my hardware faster. It really is an easy project if you paint it right the first time! once again…you blow my mind. i'm glad we share a name. i wish we shared talents! Very unique. And very classy. Great final color. Thanks for the rundown. When you're in the office with door closed, how well does it block out the noise from the rest of the house? Thanks again, and congrats on a nice project. All the wood floors seem to make the house echo, but it blocks out sound pretty well. Kara it is amazing just like I thought it would be. I'm trying to figure out where I can put one in my house! You have got some serious talent. Thanks for sharing! I love, love, love this! So creative, so amazing. I can't believe how much time you invested painting it, how frustrating, but it was worth it. That is one of my favorite colors of green. Lovely! I love the idea of chalkboard on the back. I love this!! We are going to try to do this in our youth room- my husband is the youth pastor. Where did you find your hardware at? I bought the hardware from rusticahardware.com – it's pricey but it's one of the few places that had a style I liked. Good Luck! The finish looks great! I thought for sure you had sprayed it because it looks so flawless! All your hard work was worth it!! I was more than impressed with the paint (Regal by Benjamin Moore) that I used and how smooth the finish was. Looks Great! Did you use the sheet of plywood out of necessity or to make the chalk board? Wondering if it was 100% necessary to use the plywood. Considering making one for our home, but wanted to ask this first as it is important for both sides to have the same look and feel. The plywood was necessary in our case – the chalkboard was an added bonus. I pieced together several 1×6 boards and in order to get a nice finished look on the back it needed the plywood (we were working with MDF) plus it made for a secure way to piece it all together. It wouldn't be necessary if you used real wood planks and were going for more of a rustic look. Good Luck! How did you hold the plywood together? I was looking today, and they come in 4×8 sheets. I am assuming you ripped them down to 3′ so the seam is down the middle? Did you use the birch ply, or regular old plywood? I used two sheets of plywood and they are stacked vertically, so there is a seam on the back of the door that runs horizontally. This way, when I vertically planked the wood on top of the plywood, I could nail each piece of plywood to one vertical plank. Fantastic! And I love the final color. Would you mind sharing the name of the color? I'd love to do some kitchen accessories in the same shade. So bright, juicy, rich! The final color is a Benjamin Moore color match to a Rustoleum spray paint called EDEN. It really is as juicy as it looks, I love it! I've been putting off a sliding barn door project for months and your post inspired me to get to work! I've never worked with MDF before. How many planks did you need? How much do they cost? Are they easy to paint/cut? Why did you choose those over pine planks? What was the cost for building the door alone (no hardware or paint)? Sorry for a million questions. Thanks! I used 13 planks (1×6 mdf with eased edges) for our 6 foot door. They are just as easy to cut as any piece of wood, I went with MDF because every board is straight and there's no knots. Buying wood can be painful when you're looking for perfectly straight boards and I wasn't going for a rustic look. I also liked that the MDF had an eased edge so when I planked them right next to each other it looked nice. The wood alone was around $250. It's backed with plywood and trimmed with pine (pine select which is considerably more). There's no doubt you can make it for cheaper – the hardware is what cost a lot of money, but I've seen a lot of DIY hardware that look great as well. It's easier than it looks – good luck! Thank you for answering all of my questions! This helps a lot. I love the uniformity and smoothness of your door. Time for me to get to it! It is two pieces of plywood. There is a horizontal seam through the middle of the door – just make sure the boards are flush. Once everything was put together, I used putty to fill the seam and then sanded it down before painting the back with chalkboard paint. Good luck! Welcome! I purchased my hardware from rusticahardware.com and included in my hardware kit was a floor guide. It gave the option of having a floor mounted guide, or a wall mounted guide. I chose the wall mounted because I didn't want to drill something into my hardwood floors! Walls are easier to repair! It doesn't sway at all from the wall. Hope this helps! Hi Kara! Thank you for the inspiration, my husband and I just followed your tutorial to build a similar barn door in out home! You weren't kidding when you said it's heavy lol. I was wondering if you have had any trouble with the weight or if it's held up fine over the years. I'm not sure how much mine weighs but thinking about weighing it to see if it's more than my hardware's max load of 198 lbs. Thanks so much! We haven't had a single problem with ours, but I think our hardware was rated for 500 lbs. We did make sure it was installed into the header above our door though. When zooming in on your pictures the finished project looks like the exterior edges of the door are beveled or that you set the pine frame in 1/2 inch from the edge. Although in the cross cut picture of the door under construction I don't see that detail. You also don't mention the detail in your article. Can you clarify if the door is beveled in some way on all 4 sides? Also how and why you did that? Hello! 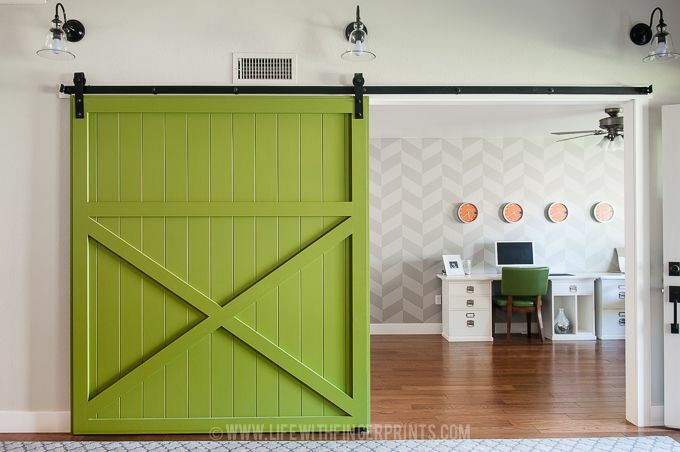 I am planning to put in a 6 ft wide barn door for my office (and it will be 8 ft tall) so it will be big and heavy like yours. I’m curious: Given the weight, is it tough to slide open and closed? Does the weight make it a struggle, or does it open/close easily? How easily it slides all depends on the hardware. We purchased hardware online and it glides so easily. You would never know that door weighed two hundred pounds! That being said – make sure wherever that hardware is mounted, you have a lot of support. Ours is screwed into a header which is your best case scenario. Isn’t it a couple hundred dollars for the hardware? Is there a less expensive option? The hardware was really expensive when I purchased it – but back then I had trouble finding people that sold that hardware. Now I think you can find it a lot of places – which probably helps drive down the cost. I love this and want to make these for closers with one big door. Is your hardware split in two? Most websites say anything over 8ft will be split in 2 equal parts. Did you specify one door when buying the track? The hardware is two separate pieces – your hardware should be twice as long as your door width. Our hardware is 12ft long and it’s two 6ft sections. The company I ordered from asked how wide my door was and sent me the appropriate hardware. How think is the door? 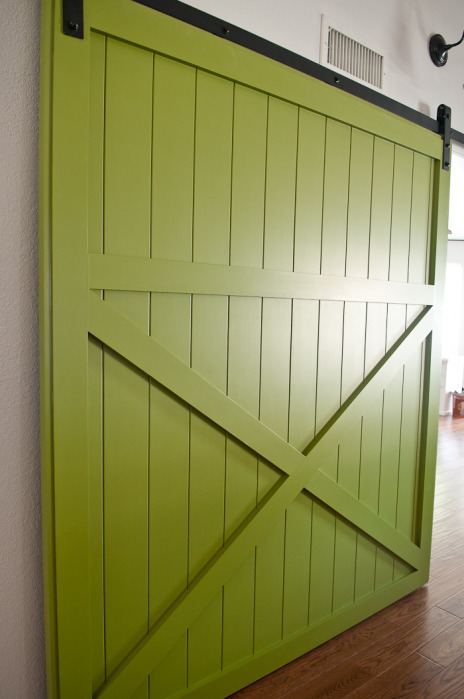 I love the barn door! We are wanting to put a barn door up between our dining room and kitchen and it’s a 6 ft opening. 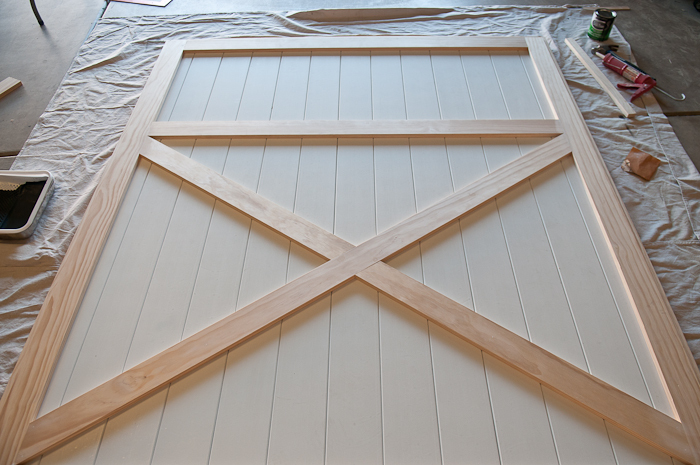 I was excited to see a 6 ft x 7 ft barn door could be done. My question is about the thickness of the door. 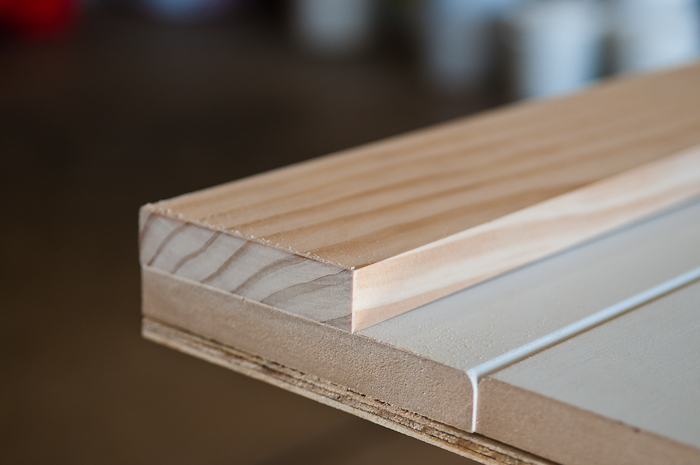 When you say 1 3/4″ thick, are you just talking about the 3/4″ plywood plus the 1″ thick planks you glue on top of the plywood? I just wasn’t sure if that included the pine. It would be so helpful if you had a list of everything you needed/used. Thanks! 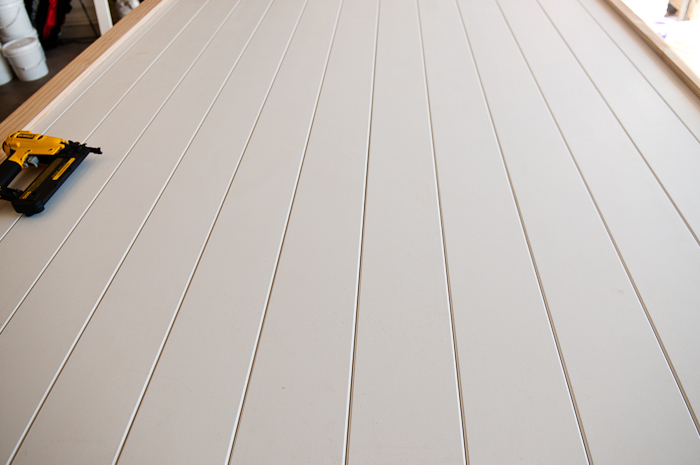 Yes – The thickness is the combination of the plywood as well as the planks we used. I did this project so long ago, I’ve long forgotten exactly how we did it!